Liz Halliday is John Hindhaugh’s guest on Globecast Radio tonight – at 20.00 BST. A downloadable version will be available from Thursday (May 4) as an MP3. 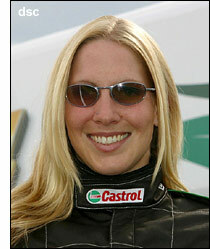 Liz began her season in dramatic style at Sebring, and will be at Houston in a week’s time, for Round 2 of the ALMS. After Mid-Ohio, she and Clint Field will be heading to Le Mans, where the Intersport Lola ran so well last year.